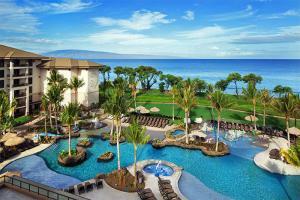 Opened in April 2017, this newest luxury resort on Maui’s North Ka’anapali Beach offers a choice of one-, two- and three-bedroom villas featuring signature Westin® touches. World-class amenities include and expansive lagoon-style pool, full-service restaurant, pool bar, children’s beach pool and play area, and a WestinWORKOUT ™ Fitness Studio. This resort is designed to provide a relaxing haven complete with culturally inspired programs and authentic Hawaiian experiences. Located on 16 acres of Maui's Ka'anapali Beach, this hotel is just minutes from numerous shopping and entertainment destinations.